We interrupt this conservation blog with a fishing report. Nah, it’s the other way around. Chesapeake Light Tackle will always be first and foremost a fishing-report website. Well, fishing reports along with some occasional good advice about gear and techniques. Don’t worry – I won’t be lightening up on Maryland DNR’s bad decision to increase rockfish harvest by 14 percent in the face of impending cuts, but I wanted to let you know that I have been lighting up some local fishing spots lately. It’s the holidays, and the weather hasn’t been great, but there are still some fish to be caught for those who are willing to brave the elements and cast for them. The warm water discharges have been hit-and-miss lately. Most of the anglers who have visited them have been disappointed, but once in a while, I hear of a good fish or two being caught. The same goes for the deep holes at the mouths of the rivers and also for my go-to-winter honey hole: Light Tackle University (“LTU”). If you don’t know where LTU is yet, I’m not going to tell you now. You can easily find it by reading my book Chesapeake Light Tackle, An Introduction to Light Tackle Fishing on the Chesapeake Bay, or if you’re web-savvy enough, I bet you could turn it up with any search engine. Better yet, just scroll back and read a few winter reports on this blog. I nicknamed it Light Tackle University because it’s where I and several dozen of my fishing buddies refined our rockfish jigging methods. It’s a make-it-or-break-it kind of place that will either sharpen your skills and turn you into an adequate light tackle fisherman, or discourage you enough that you’ll be doomed to a life of forever trolling and soaking bait. I consider this spot to be the ultimate light tackle classroom. Every year more and more rockfish winter over in the Bay. They usually hold semi-dormant in deep holes where the water is warmer, but come out to actively feed in areas of high turbulence. Although stripers love fast-moving water any time of year, in cold weather they are especially attracted to locations where downward agitations force baitfish deep into the thermal layers of the pycnocline. Winter fish prefer warmer saltier water layers even when there is more bait in other places. In other words, they’d rather eat a little in an area where they are comfortable than a lot in a place where they’re not. That’s one of the primary principles of light tackle fishing. LTU is a perfect example of that principle. The area around the Bay Bridge usually holds fish well into February, but the trick is knowing how to catch them. Hydrologists who study the Chesapeake recognize the area around the Bay Bridge and immediately north as an Estuarine Turbidity Maximum or ETM. Water in this area is in a constant state of flux for four primary reasons: the proximity of several large fresh-water rivers, the geophysical narrowing of the Bay, saltwater currents from the Atlantic Ocean, and the turbulence created by the structure of the bridge. Fluctuations in tidal currents and water movement caused by wind can result in multiple hydraulic layers of differing salinities and temperatures. The challenge for the fisherman is to find the layer the fish like best and jig in that layer. Sometimes cold-weather stripers will suspend in mid-depth comfort zones, but usually they’re hiding out closer to the bottom. An area where the temperate band intersects the bottom will usually hold fish. Find a turbulent area where a comfort zone corresponds to rocky structure, and you’ve got yourself one heck of a winter fishing spot. The warmer water will hold baitfish like bay anchovies and menhaden, and it also holds white perch. Perch are usually spread out closer to the bottom while the bait is more likely to suspend at mid-levels in tight schools. Resident striped bass winter over at places like this. They’re usually smallish fish, anything from 12- to 24-inches, but occasionally a big cow striper will show to feed on the perch. That’s the trick, to be in the strike zone and ready to catch those big fish when they show. It takes persistence and patience, but I usually get two or three fish over 40-inches long every winter at LTU. I slipped into LTU on Thunder Road last weekend about noon. It was pouring rain and I was the only boat there. If you’ve ever fished it, you probably know that it’s a big plus to have that spot all to yourself. You can make a lot of noise and still catch a plenty of small fish, but if you hope to catch a big one, you have to be very quiet and sneaky. Everything matters. I step lightly in the boat, I’m very careful to close hatches softly, when I start the engine to reposition, I swing very wide around the area where I think the fish might be so I don’t spook them. The sweet spot at LTU is almost always the up-current, channel-side, corner. That rule holds for almost any fishing spot on the Bay. The best fish will usually be on the side of the structure that the current pushes against, and is closest to deeper water. I had light incoming current, so I set up on the southern corner, killed my engine, and let the boat drift across the sweet spot, always casting behind the boat. The wind was at my back, from the northwest about 10 knots. That was enough to slow my drift, but the tradeoff was that it pushed me in toward the rocks. If I didn’t pay attention I could have easily damaged my boat. I was throwing a color-contrasting jig head. 1-ounce was the best weight because it was heavy enough so that I could hit the bottom on every cast. I had one outfit rigged with a 6-inch chartreuse & orange BKD and another with a 5-inch Gulp Jerk Shad. Despite maintaining good bottom contact on every bounce of the jig, I didn’t get a strike on my first drift. I felt like my lure was banging the bottom in the 35-40 foot range. My fish finder showed a few fish there, and some bait a little higher, but I wasn’t getting bit. Next drift, I started farther off the rocks in deeper water, this time 45-50 feet. Wham! A strike before my lure ever hit the bottom. I missed, then missed a couple of more strikes. A lot of little tap-taps usually means perch or very small rockfish. That’s not necessarily a bad sign in the winter at this spot. I want to be jigging where the perch are when a big fish shows up. Finally, a fish came tight. It was nothing more than a 16-inch rockfish. I hooked up again on the next cast, a 12-inch perch. I got about 8 minutes of jigging before I had to restart the engine and reposition the boat. That isn’t any sort of norm or standard, that’s just what the conditions of the day dictated. It’s always different and changes frequently. Sometimes the drifts are very fast – sometimes they’re slow. The next drift over a similar bottom contour resulted in similar results. I was getting a few fish in the 18-24-inch range, with some white perch mixed in. Another boat showed up. He dropped a bull minnow down on a bottom-feeler rig and hooked up with a tiny rockfish right away. I watched him drop minnows at least another dozen times and saw that he always caught a little fish. He went through his minnows quickly with nothing any size to show for it, then tried trolling a circle around where I was jigging the better fish. That didn’t work so, he left. If he’d come closer I would have offered him a jig head and a soft plastic bait since that’s what the fish wanted. It was getting late in the afternoon. I was having fun and catching fish despite the cold wind and pouring rain, but conditions were steadily deteriorating. The current was rapidly increasing and the fish were moving even farther out off the rocks. My window was closing. It would be dark in another 20 minutes. To make matters worse, I kept hanging up on a broken-off line that was stretched across the bottom at about the 45-foot mark – exactly where I wanted to jig. When I hung it I could pull it up some, but never enough to pull it out of the way. That meant way too many break-offs and lost jigs. I had been avoiding the area where I knew the line was, but I mistakenly let the boat slip back over it and, wouldn’t you know it, hung it again. At least I thought I did. Suddenly, the snag pulled back. 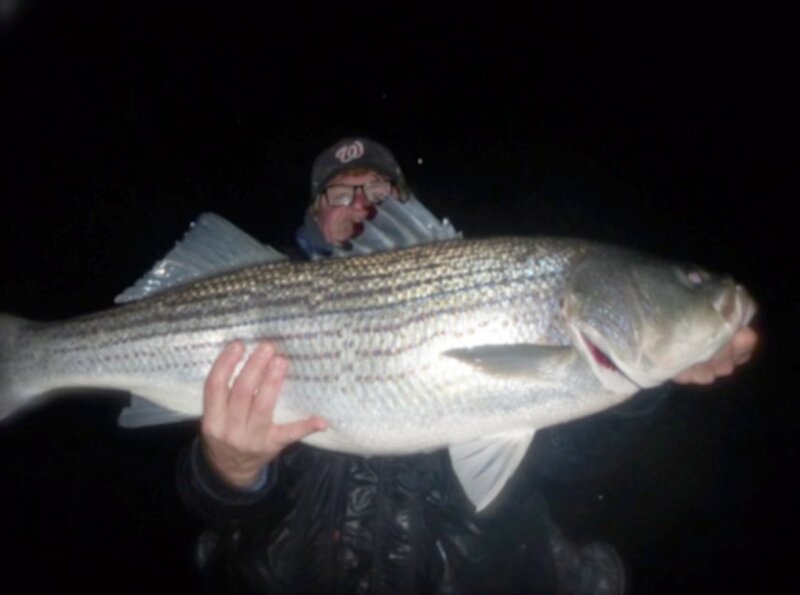 Big fish move slow in cold water but there was no mistaking the tell-tale body bends of a big striper. After a couple more head shakes, the fish took off, taking line against my drag toward the channel. I pointed my rod in the direction the fish was running and reached down with my other hand to start the engine. I’ve taken a couple of 50-pounders off this spot so I wanted to be prepared to chase if it looked like I might get spooled. Fortunately (or not) the big fish tired quickly against the moderate drag and I started gaining ground. After a short fight I brought the very wide 36-inch striper to the side of the boat. My water-proof camera was already set up on a 10 second delay and resting on the leaning post. I pointed it toward the back of the boat and pushed the button to take the picture. That gave me just enough time to pull the fish over the rail and hold it out toward the flash. I didn’t expect the picture to be great in the waning light and the pouring rain, and it wasn’t, but it at least documented a nice fish that I felt I had worked hard for. It was only 4:30 PM, but the days are short in December so it was almost dark. I decided not to make another drift. In 5 minutes I was back at the Matapeake ramp. I hope to make several more trips to LTU this winter. If the pattern of years past holds true, expect the fish to hang in there until spring rains wash away the thermoclines. The area can also provide pretty good white perch fishing all winter. I’m also hoping to work in a few pickerel and crappie trips over the next couple of weeks. 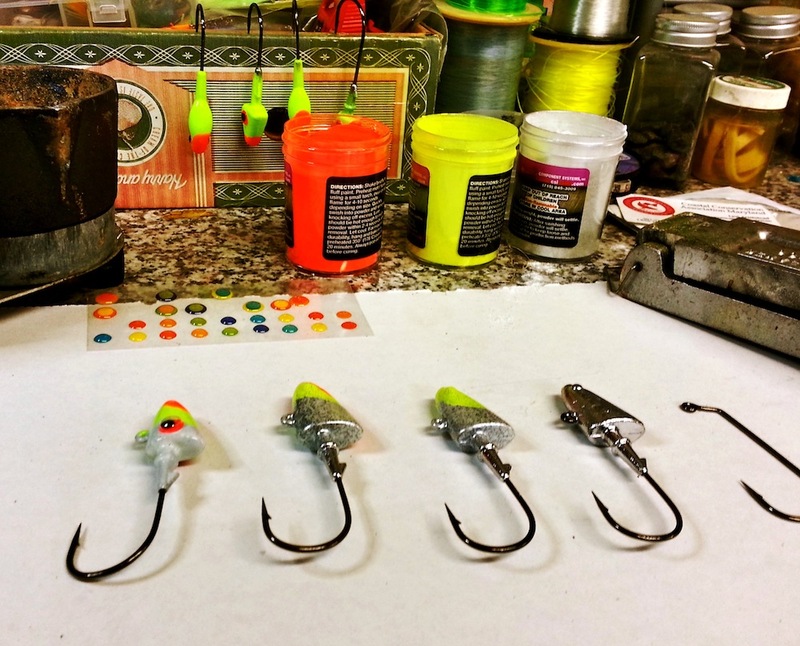 In the mean time, I’ll be hanging out in my shop and pouring a few more of those color-contrasting jig heads. Good luck if you get out. Bundle up and make sure you wear a PFD because one mistake in 39-degree water can be deadly. Merry Christmas and best wishes for lots of big fish and let’s also stay tuned to conservation issues in 2014. Let’s light ’em up! I always enjoy your informative blog posts. I always wondered where the perch went once the temps drop and your explanations help. Now I’m itching to get back out on the water and ditch this cabin fever. Pickerel sounds good, too! Shawn, can you explain what you are seeing on your sonar shot at the beginning of this article? I have the same Lowrance HDS system, but I don’t know if I’m seeing the same things you do. Great report and good information as always. I’ve been wanting to get out to LTU for some c/r, would be nice to take a couple perch home too. Do you ever throw the 7-10″ plastics there targeting the bigguns or just stick with the 5-6″ and weed through the smaller fish? Light ’em up. I am with you, brother. Light ’em up. I am with you, brother. Please let us know next time you are in Pennsylvania. Excellent article, nice fish and awesome jig heads. Very well-written and entertaining and makes me want to go fishing. Lots of gold in this report, Thanks and merry Christmas . BlueMarlin – I replaced the fish finder shot with an annotated version. To see it better click on it to make it full size. The larger window to the right is sidescan set at 80′ in both directions. The top right view is downscan and the bottom right is the same view using traditional ff sonar. Note that side and downscan shows more bottom detail, rocks, pilings, etc. 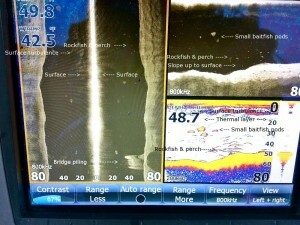 while traditional sonar provides a much better return of the fish. I marked the top thermal layer but there is at least one more below it. That’s why the fish are holding deep. I can usually make out that bottom layer when my unit is set well, but this picture doesn’t show it. Hope that helps. Shawn, thanks for the sonar shot update. It is helpful to see what you see on the charts. I think alot of us learning LTJ struggle with what we actually see. 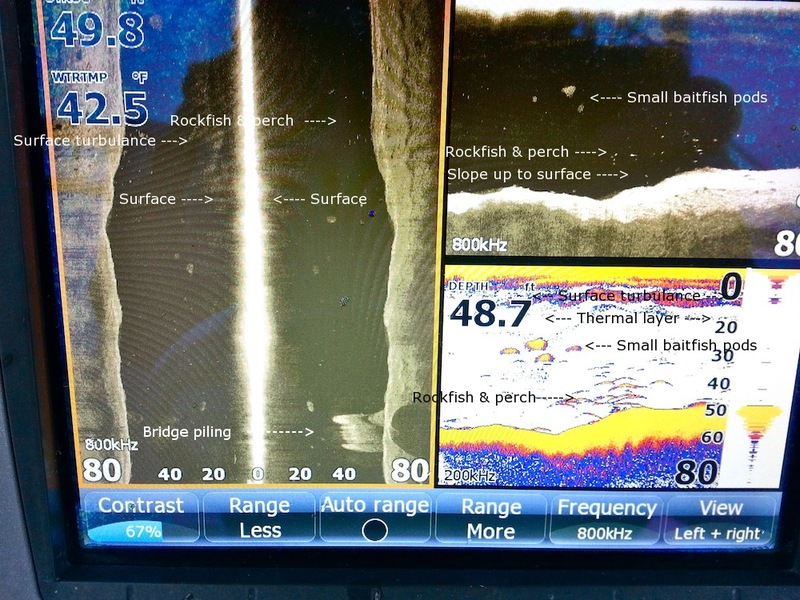 I have three major take aways from your blog this winter on this: 1) Look for the layers, 2) find what the fish are feeding on, and 3) use the depth finder to understand the structure you are fishing. The question I have remaining is when I am not catching fish but I see them, knowing if it is me, the fish, or I am actually not seeing striped bass but something else living in the bay (rays, perch, mud shad, ect)? Heard you had a great day last week with James. I had been asked to go as well, but family stuff got in the way….what else is new. Sooner or later, I hope our paths will cross. Happy New Year to you and your family. Thanks for the report Shawn. Do you find that in Dec, Jan and Feb at the “LTU” there is one type of day that is better than another? That is, is a day following several days with temps in the high 40’s better than a day following several cold days (such as this coming weekend)? I’ve tried to figure this out myself and have never seen a pattern other than I do poorly in the winter on really cold days but that could be because I’m so uncomfortable. This is a great blog. And well written! Thanks for taking the time to document all of this. 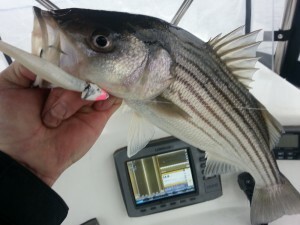 Being new to the area and new to Striper fishing, it is great to have a source like this blog to start from. Again, I really do appreciate your willingness to share this information. Keep up the good work. Thanks for the info and a great story. 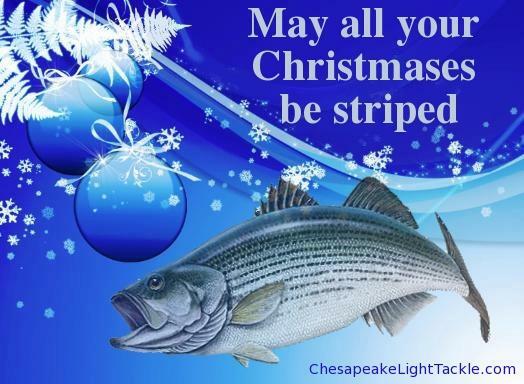 We are fortunate to have you as a voice for conservation and striper management. Am also lost in the sea of blobs and clutter I see on my black and white Lowrance MK V. With limited resources my friend and I fish from a 16 ft rowboat / 10hp and have a blast catching 15 to 24″ stripers on local creeks. Have learned a ton recently from your blog and books and casting with a local guide. Thought we had some of the sonar vodoo figured out last Oct. when we actuallly caught stripers we thought we were seeing in 4 differant areas on the same day. We caught over 40 fish and were finally convinced the blobs and clutter on the screen were bait balls and stripers and not just eye candy generated onscreen as an evil marketing gimmick 🙂 (apologies to the good folks at Lowrance). Water surface temp had dropped to 58 that week only 3 deg colder than the previous week but the dense schools of baitfish we had seen in the shallows were gone. Guess they moved into deeper water maybe near the creek mouth which was a bit beyond our range in the small boat. Our dilemma was getting similar readings, sometimes in 10ft of gin clear water where you could see oyster shells and rubble on the bottom and no fish, yet the screen often showed horrizontal oblong images of various sizes numbers and depths wether we were anchored or drifting. My humble depth finder has taught me much about the area we are learning to fish, but can’t help but wonder if we are wasting our time trying to locate fish with it or just need a better education on how to use it. Am sure there are many who could benefit from an honest appraisal of modern sonar technologies and the limitations if any beside screen size and resolution of the lower priced units targeting moderate to lower income anglers. Thanks for listening and any advise or comments you might offer.